Looking for a delicious breakfast in Asheville, North Carolina? 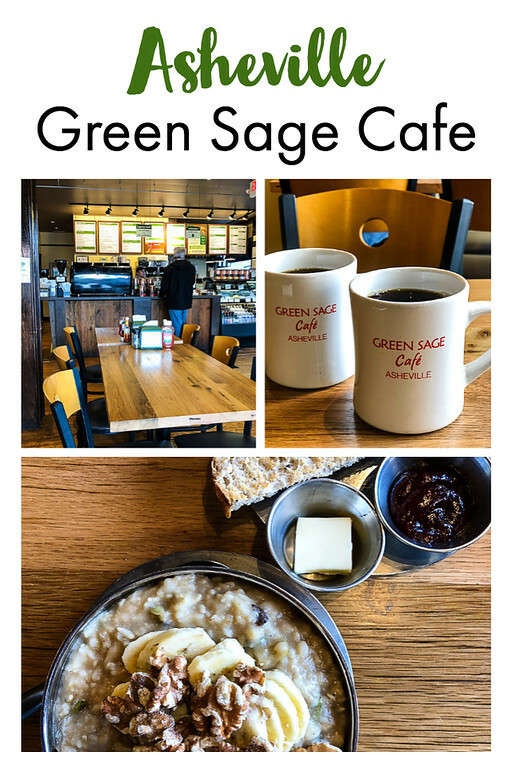 The Green Sage Cafe is a certified green restaurant serving local, organic and sustainable food! We spent sometime trying to decide where to have breakfast in downtown Asheville. We had already eaten at Early Girl Eatery and were looking for another place to try. I was reading about Green Sage Cafe and everything I read sounded perfect! They are a certified green restaurant. Their food is nutrient rich, chemical free, 95% organic and thoughtfully sourced. They focus on plant-based food that is GMO free with no unnatural ingredients. They even care about their cookware, using an eco-friendly line of cookware. It was a short walk from our downtown Asheville hotel. When you first walk in, you come up to the counter for ordering. I was cold, so I went to sit at a table and let Tim order at the counter. It is a pretty good sized restaurant with one room of tables by the counter and another room on the other side. It’s decorated with lots of warm wood. The menu offered lots of choices. For beverages, there was coffee and cocoa, espresso, hot and iced tea, cold drinks, fresh pressed juices, smoothies, coconut milk shakes and beer and wine. Since we were there for breakfast, we looked at the breakfast bowls, sandwiches, brunch plates, omelets and pancakes. If you are there for lunch, there are hot and cold sandwiches, burgers, salads, soups and rice bowls. Everything sounded delicious and debated between Everything Avocado Toast, The Appalachian Trail (scrambled eggs, root hash, bacon, and buttermilk biscuit) or the Wild Blueberry Pancakes. 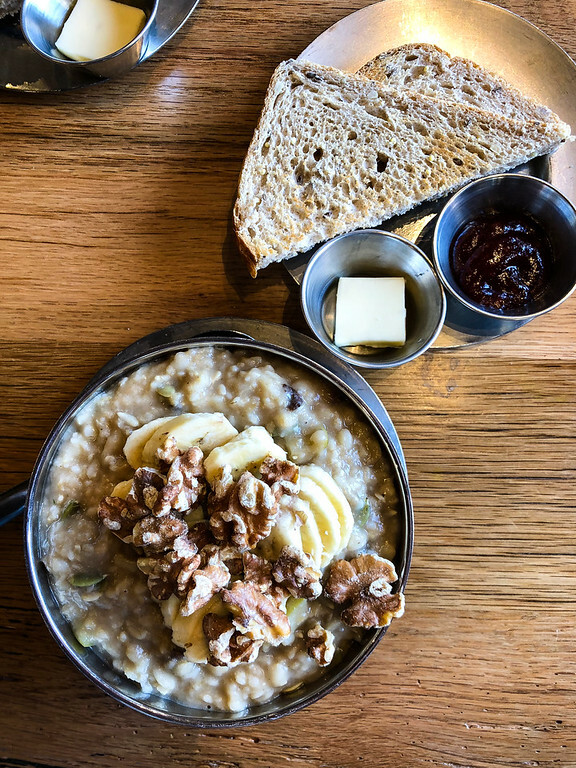 Since it was a cold and windy morning, the very first menu item – the Apple Sunflower Oatmeal sounded perfect. It had gluten free oats, and a slew of other organic ingredients – apples, pumpkin seeds, sunflower seeds, cranberries, raisins, maple brown rice syrup, ginger, cinnamon and coconut oil. And if that wasn’t enough I had it topped with bananas and walnuts and served with a slice of multigrain toast. The oatmeal was amazing, warm and comforting and full of flavor. 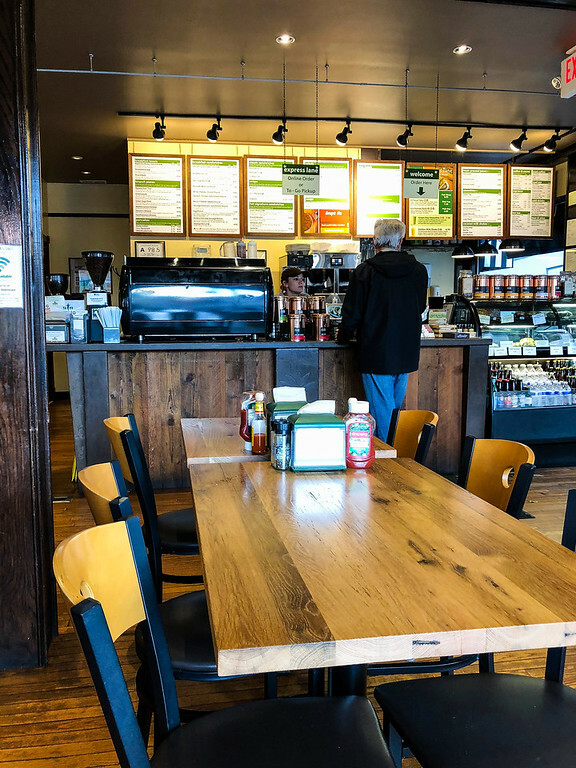 The staff was extremely friendly and the place was so comfortable that had we not other things on our list that day, we would have lingered even longer over their delicious coffee. 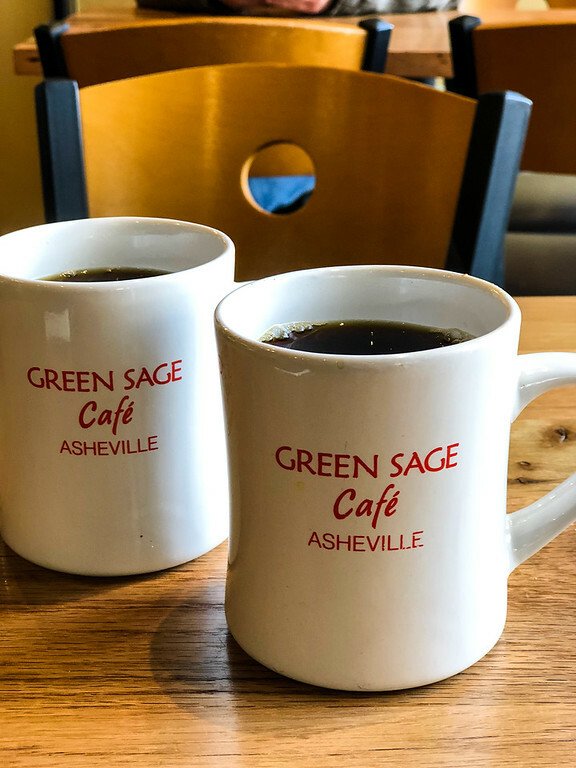 If you eat at Green Sage Cafe, I’d love to hear about it in the comments! Tell me what you ate! I’d probably choose the pancakes because I like to treat myself when I’m out but that porridge looks delicious. I treat myself a couple of times, but then also try to balance it out a bit!